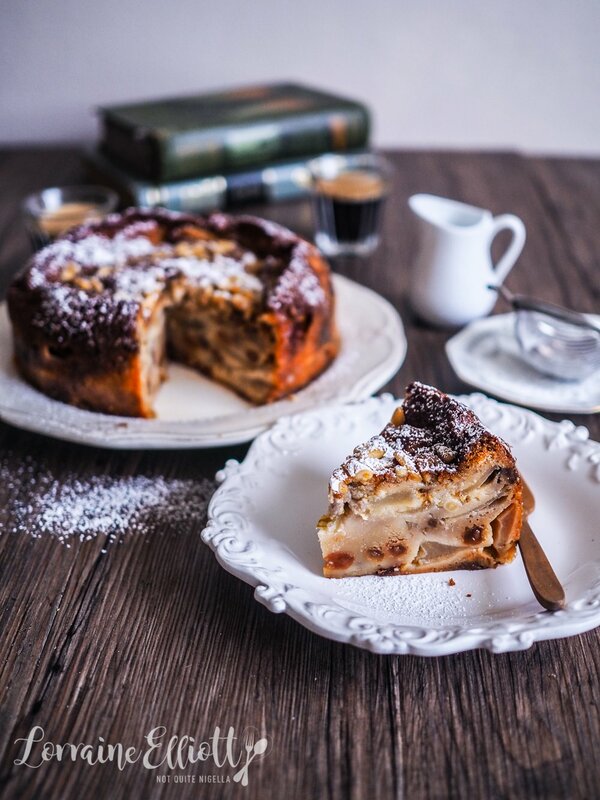 This Sicilian apple cake recipe is a delight. Chock full of apples (a kilo or 2.2lbs. 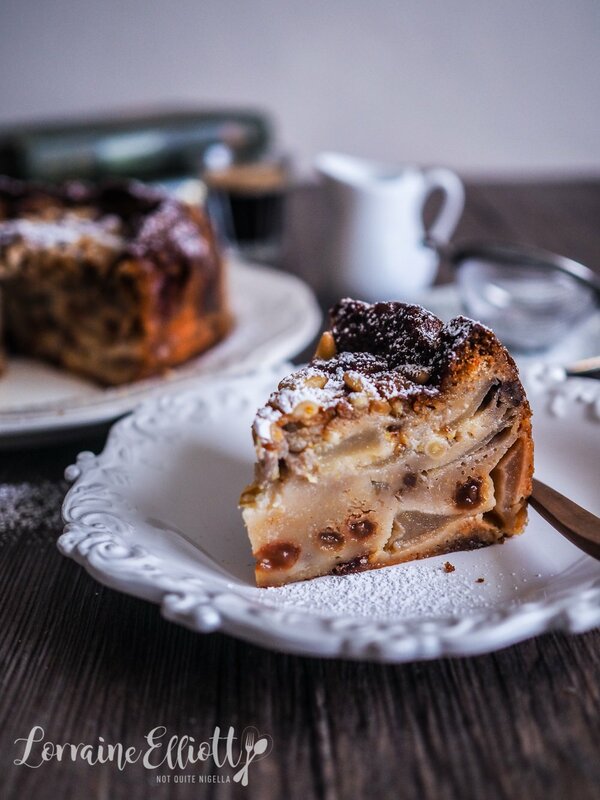 worth), it is a little bit strudel, a little bit cake but a lot of yum. There's the goodness of rum soaked raisins, toasted walnuts, pine nuts and a final blanket of icing sugar and rum! I called her Serafina. 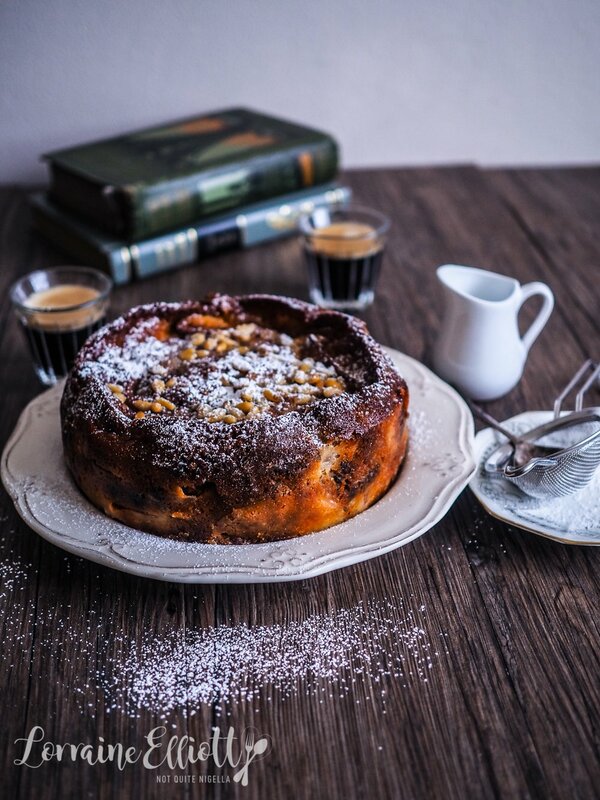 I first came across this Sicilian apple cake when I asked for cake suggestions from people on Instagram. I wanted to make something but was fresh out of inspiration. Then a few people suggested this Sicilian apple cake. I had never heard of it so I googled it and I came upon something very interesting. 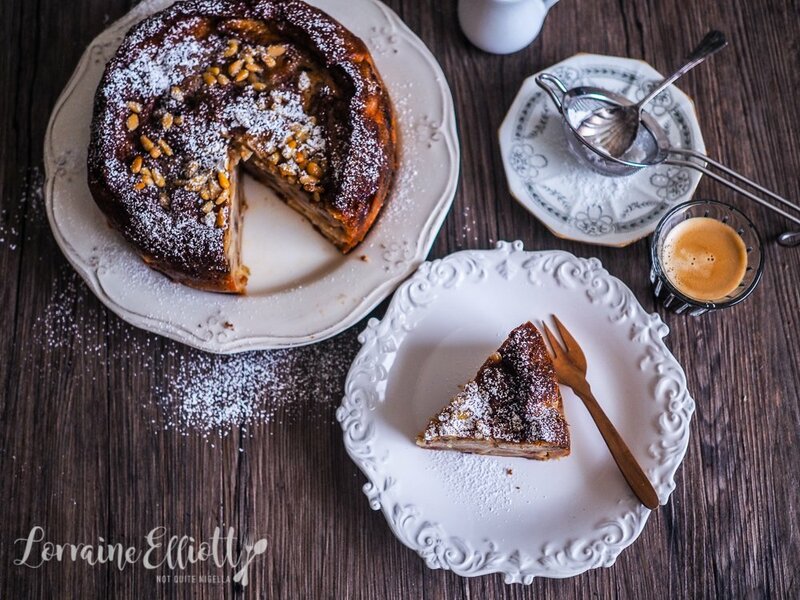 Almost every recipe for Sicilian apple cake was pretty much identical! This is an impressive cake for both looks when you cut it and heft. 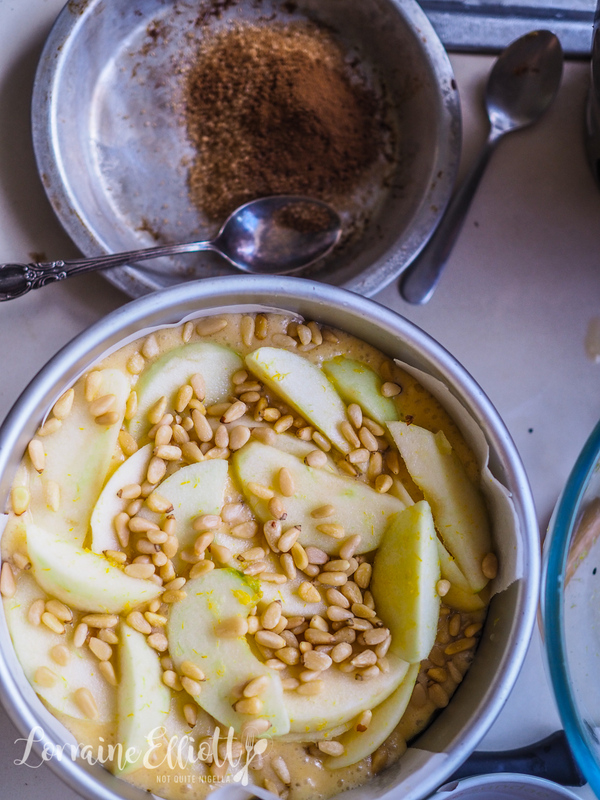 With a layer of vanilla batter, apple slices, rum soaked raisins, toasted walnuts the symphony is repeated another two times before the cake is bestowed its final sprinkling of crunchy cinnamon raw sugar and pine nuts. After the cake is baked for 1.5 hours the rum soaking liquid is then poured onto the cake where it is absorbed. The rum soaked raisins, raw cinnamon sugar and dousing of the rum were my additions. You know me Dear Reader, I cannot leave well enough alone. After all this was a cake that would also be a thank you gift for a friend. It was for my dear friend Celia who is a handy seamstress. Mr NQN has two pairs of expensive denim jeans that are slightly worn and she offered to patch them up for him. I knew I was going to be near her house for a doctor's appointment so I said that I would drop off the jeans. Celia is always so generous and I didn't want to come empty handed. So I decided to bake her this cake as a thank you gift. I love kooky, quirky people and Celia greeted me in the driveway whispering that she was looking out for the magpies that were swooping people. She invited me in for a cup of tea and a chat and she gifted me a set of tea towels that she made from jeans. She makes aprons out of them and I thought that tea towels might be a good idea and like the clever little thing that she is, she whipped them up and made an embroidery pattern on them and sent me on my merry way with a loaf of freshly baked rye sourdough made with Tasmanian honey. I walked out through the garden and past where the chickens were kept. Celia used to have a chicken called Not Quite Lorraine who was named after me. NQL is long gone-she went to a farm in Queensland (and probably to the farm in the sky) but Celia and Pete felt that they had named her well. "She was a ninja eater," said Celia. She would leap down from the roost and eat as much as she could before the bigger chooks got to it then run away". NQL like her namesake was petite, super fast and always made sure she was fed. "She was also bonkers," added Celia. Haha! 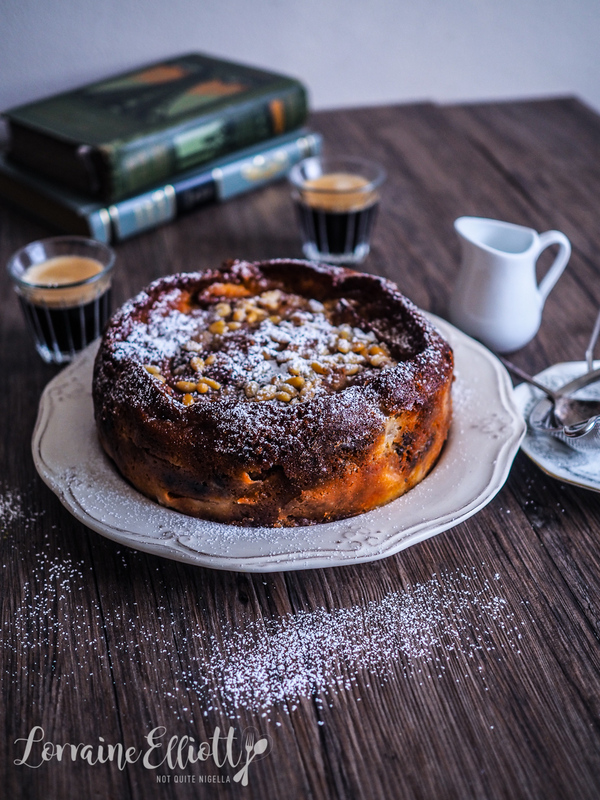 So tell me Dear Reader, have you ever heard of a Sicilian apple cake or made one before? And have you ever had an animal or indeed a person named after you? Step 1 - Preheat oven to 170C/330F. Line a high sided 20cm/8inch or 22.5/9inch round tin on the base and sides. 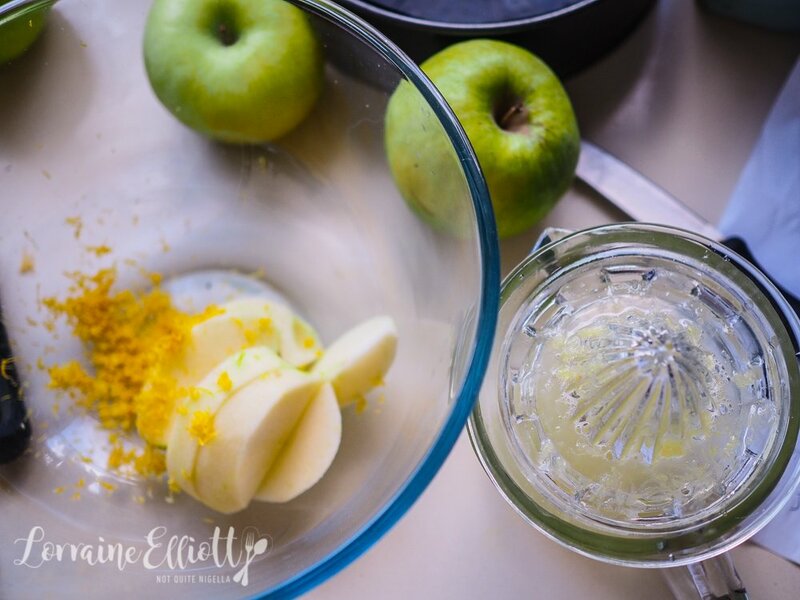 Toss the apple slices in the lemon juice and zest. Step 2 - Whisk the eggs and sugar together for 5 minutes or until thick and pale. In a jug whisk the cake flour, baking powder and salt until mixed. Combine the flour mixture, egg mixture, milk, melted butter and vanilla and stir until just combined. Step 3 - Take 1/3 of the mixture and scoop it into the tin. 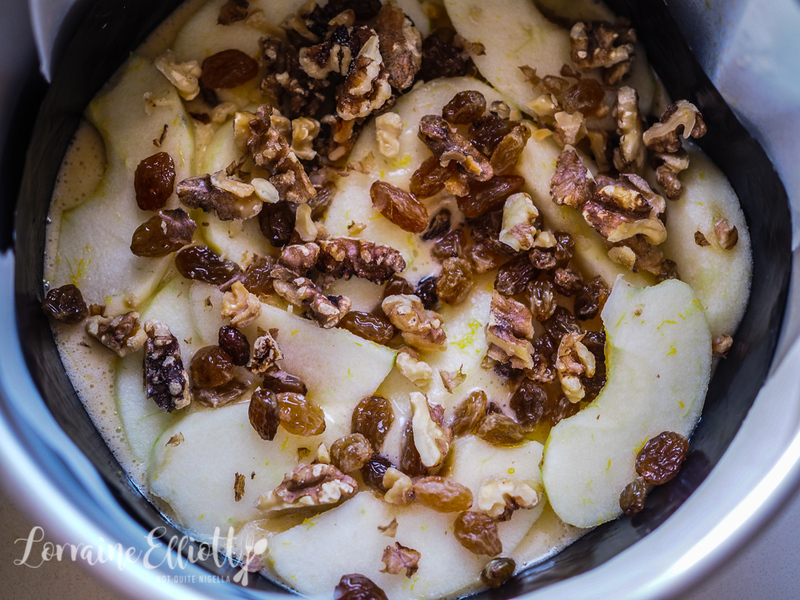 Add a third of the apples and then half of the sultanas (reserve the rum) and half the walnuts. Repeat this again with another 1/3 of the batter, 1/3 of the apples, the second half of raisins and second half of walnuts. 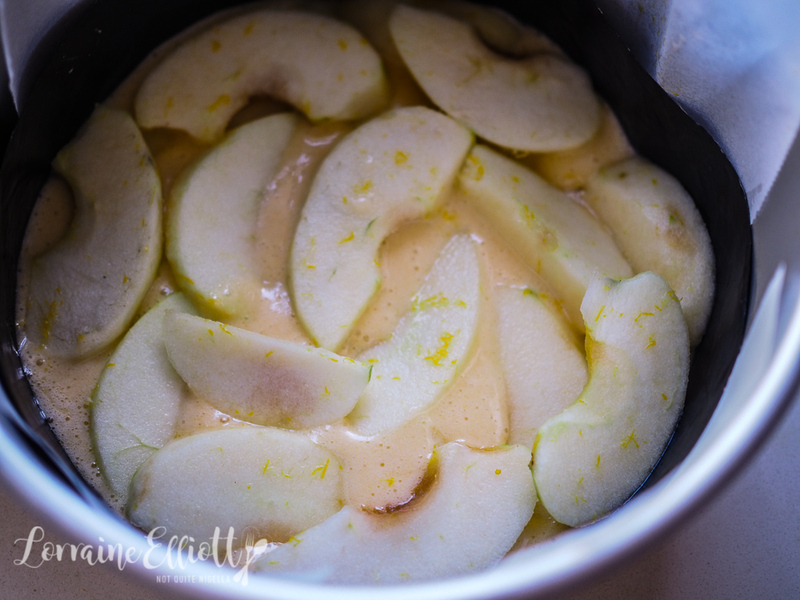 Then add the last third of batter and apples. Step 4 - Scatter with pine nuts and cinnamon mixed with raw sugar on top. Bake for 1 hour. If it is getting too burnt, cover with foil and bake for another 40-50 minutes. Pour the rum over the hot cake as soon as it is out of the oven. ssssDust with icing sugar before serving. recipeLove Dem Apples? The Incredible, Invisible Apple Cake! recipeMilo Whisky Chocolate Cake With Chocolate Fudge Frosting For Father's Day! 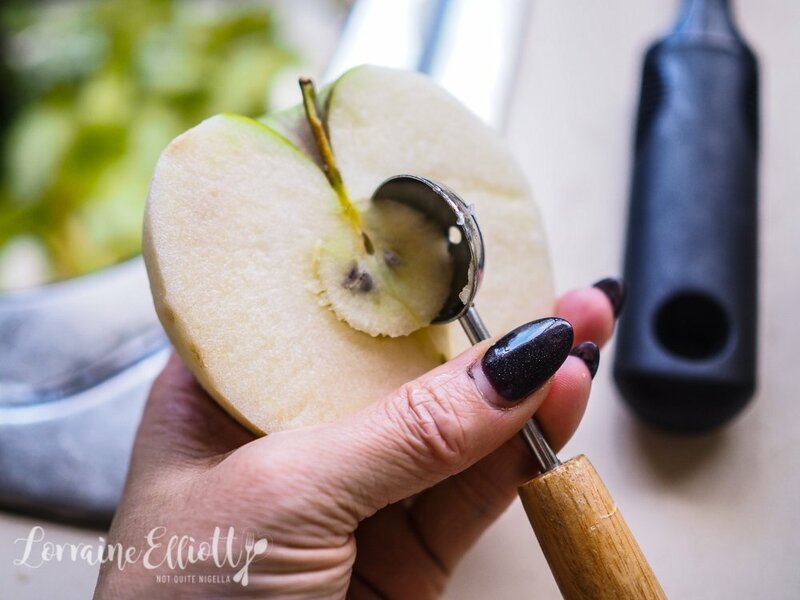 recipe Love Dem Apples? The Incredible, Invisible Apple Cake! recipe Milo Whisky Chocolate Cake With Chocolate Fudge Frosting For Father's Day!